We all need help in the kitchen sometimes....especially in the winter months when finding fresh ingredients is not always easy. 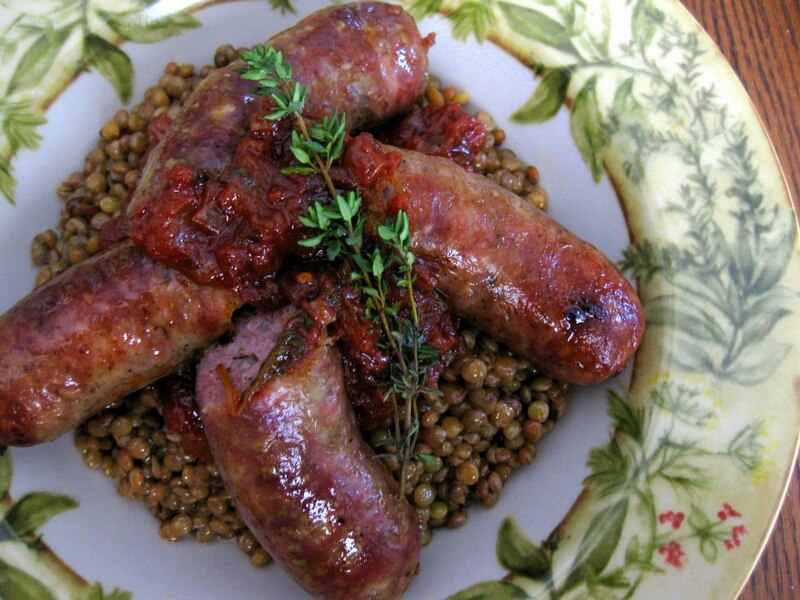 In the case of this hearty sausage and lentil recipe, I used Louise Prete Fine Food's Tomato and Basil Pasta Sauce. It is made using a family recipe and "uses the highest quality imported Italian tomatoes, spicy basil, robust olive oil and fresh onions and garlic all slow simmered in small batches to create a sauce with wonderful depth of flavour and incredible aroma." When I first tried this sauce, I was pleasantly surprised that a jarred sauce could taste so fresh. I was given a jar to take home and waited to find the best way to use it. 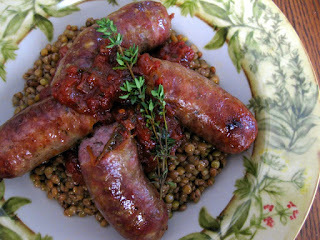 Then inspiration struck with this recipe.....I would use it in the Salsa Rossa! I loved it and so did my dinner guests. 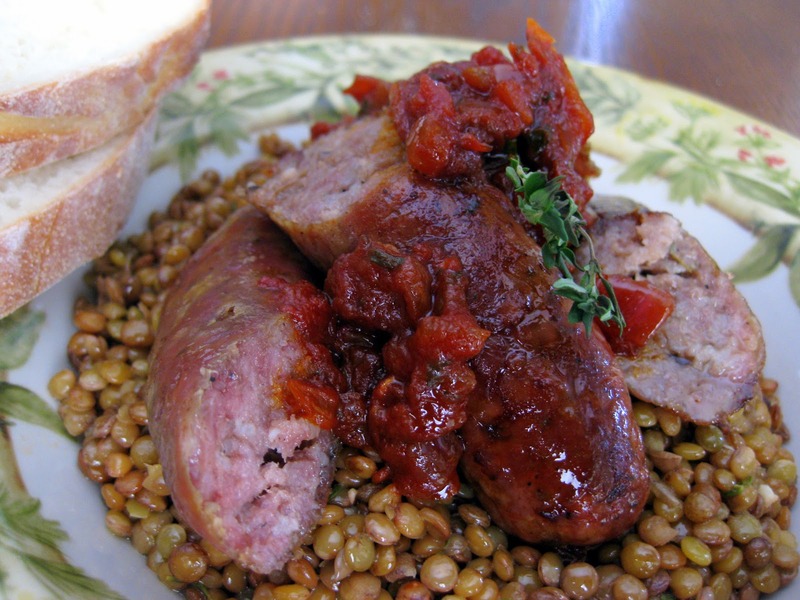 This dish is hearty, healthy and the perfect winter weekend lunch served by a fire with a bottle of beer and fresh bread. Enjoy! 1. First things first, get your salsa on the go. Put a little olive oil into a pan, add the onion and sliced garlic, throw in the cinnamon stick and a good crumbling of chilli, and fry on a gentle heat for 10 minutes until the onions are soft and sweet. Now turn the heat up and add your red wine vinegar – it will steam and might even make you cough but this is a normal reaction! Then turn the heat down to low and add your tinned tomatoes, chopped up. Add the tomato sauce and simmer slowly for half an hour while you get on with your lentils. 2. Preheat the oven to 400ºF. Put the lentils into a pot, cover them with beef stock and water, and add the 2 whole cloves of garlic, the bay leaf and some tied-up stalks of parsley and sprigs of thyme. Simmer for around 20 minutes, making sure that you've got enough liquid covering the lentils. Toss your sausages in a little olive oil and put them in a roasting tray in the preheated oven for 25 minutes or until golden and crisp. 3. Once the lentils are cooked, remove the parsley & thyme stalks and bay leaf and pour away most of the water from the pan. Mash the garlic cloves up with a spoon, mix in with the lentils and dress them using 4 tablespoons of good extra virgin olive oil and 1 or 2 tablespoons of vinegar. Throw in all your finely chopped parsley leaves, mix and season. 4. Remove the sausages from the roasting tray and pour away any fat. Tip the lentils into your serving bowls. Remove the cinnamon stick from the salsa rossa and discard it, then season well to taste and spoon it over your lentils. Place 2 sausages, either sliced or whole, on top. Sprinkle with the thyme and serve. It sounds packed full of flavour Paula.